If you're like me, you love "A Charlie Brown Christmas," the beloved holiday TV special featuring the characters from the Peanuts comic strip, drawn until 2000 by Charles M. Shultz. It premiered on CBS on December 9, 1965 — fifty-three years ago this week! I was just seven the first time I saw it, and I have watched it every year since then! My kids have watched it every year too! And I imagine most of you have as well! This year, for the very first time, Christ Church Carrollton is set to perform our own version of the traditional children's Christmas pageant that is central to the plot in this annual Christmas classic. I can't tell you how much I am looking forward to seeing the kids of our little Sunday school joining Linus and Lucy, Violet and Snoopy, in acting out the same basic story we've all heard countless times, complete with a Narrator, an Angel, Shepherds, Sheep, Mary, Joseph, and Baby Jesus. The good thing, as I've assured the co-Directors Grace and Brian Laird, is that you can't really mess up a children's Christmas pageant! It'll be cute no matter what! I know Leslie and I will have only stellar reviews when our grandsons William and Thomas Laird make their stage debut as sheep (fingers crossed), along with any other nursery-aged children we can coax down the aisle. The other stars are Liesl Blair, Noah Blair, Teresa Carruth, Luke Myers, Rebecca Myers, Grayson and Patton Scott, and Jonah or Isaac Wood! Of course, it's always fun to watch our church kids be...well...kids! Did I mention I can't wait?! But there's a quadruple blessing in watching our kids interact with a story that goes back long, long before Peanuts, long, long before TV. It's the story that has stirred millions and millions of hearts for over 2,000 years—the story that is greater than all stories—the story of the birth of Jesus Christ. Our pageant starts this coming Sunday, Dec 9, at 5pm and should be over by 6. We'll sing some favorite carols, and we might enjoy refreshments together afterwards. Grandparents, aunts, uncles, friends, and the Downtown community are all welcome. For better or worse, our pageant will be simple and humble—like our church—with minimum staging and minimum fuss, homemade props and costumes, and no camels or pyrotechnics. If you remember the original TV show, you'll remember that simplicity and humility are featured prominently. While taking a break from a pageant rehearsal, Charlie and Linus are sent to buy a Christmas tree—"A great big, shiny, aluminum Christmas tree," says Lucy—to serve as a decoration. But instead of something big, flashy and neon-lit, Charlie chooses a plain little tree, the smallest and humblest in the lot. When they get back to the other kids, they laugh at Charlie's little tree as it loses all its needles and looks poor and pathetic indeed! Do you remember the rest? Charlie: I shouldn't have picked this little tree. Everything I do turns into a disaster. I guess I really don't know what Christmas is all about. Isn't there anyone who knows what Christmas is all about? Linus: And there were in the same country shepherds abiding in the field, keeping watch over their flock by night. And, lo, the angel of the Lord came upon them, and the glory of the Lord shone round about them: and they were sore afraid. And the angel said unto them, Fear not; for, behold, I bring you tidings of great joy, which shall be to all people. For unto you is born this day in the city of David a Savior, which is Christ the Lord. And this shall be a sign unto you: Ye shall find the babe wrapped in swaddling clothes, lying in a manger. And suddenly there was with the angel a multitude of the heavenly host praising God, and saying, Glory to God in the highest, and on earth peace and goodwill towards men." 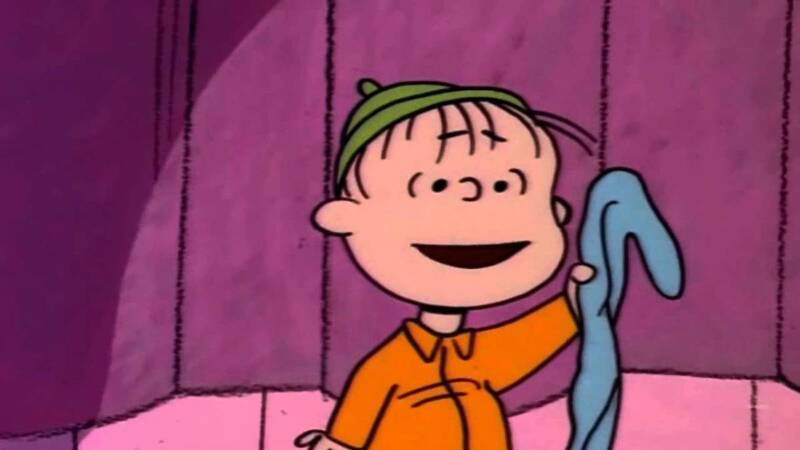 Linus finishes and comes back to Charlie and his humble, little tree and says, "It's not bad at all, really." The tree is lovingly decorated, Charlie's choice is vindicated, and he and Linus and all the Peanuts’ pageant cast and crew look heavenward as they sing "Hark, The Herald Angels Sing." I get choked up just thinking about it. Like Charlie's tree, Christ Church Carrollton is simple, humble, plain and not the least bit flashy. But we have a great God who delights in using humble things (like mangers and shepherds and precious children and little churches) to accomplish his great purposes. I hope this year's pageant will be the first of many, many pageants at Christ Church—a new, very old tradition—proclaiming the story of Jesus' birth!